As much as I adore tropical treats, in the middle of winter they just don't always feel right. It's so easy to forget the wealth of local specialties that come from you're own cold climate. These are usually hearty, healthy and perfect to get you through a biting winter's (or summer's, if you live in England...) day. Lately, however, I've become very interested in cold climate foods that are beautiful, delicious and healthy. To my surprise (aren't healthy foods usually expensive and tantalisingly exotic, most likely from the heart of a tropical rain forest? What's so special about waxy new potatoes, blue-green kale, fresh grilled fish...) I loved the foods I read about, and eating them in winter felt so right. Even better: according to research, these foods are just as healthy, but minus the marketing. Cold climate food doesn't have to mean gorging yourself on pies and cheese and chips. Trina Hahnemann (Denmark's Nigella, but healthy!) 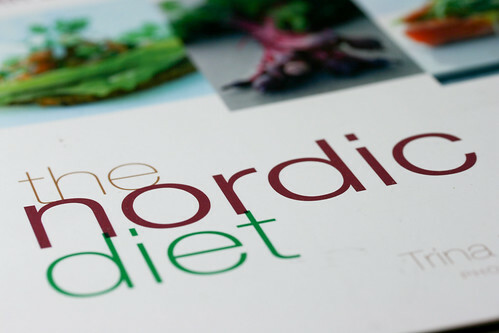 has brought out The Nordic Diet book; a guide on how to eat wholesome, delicious foods in our less than forgiving northern climate. Hahnemann claims that the Scandinavian diet should be the diet model for Northern Climates as opposed to the standard model we're told to follow: the Mediterranean diet (which, by the way, studies were based on war-time Med, when people were frugal; the contemporary Med diet, with its abundance of olive oil, meat etc. is very different, and without the same claim to health). Hahnemann concisely sums this up: "I think that people have lost their food culture and forgotten about how foods suited to northern climates can be healthy"
The diet principles are pretty basic, pretty sound, and make perfect sense for hearty yet light food. Mountains of our northern, hardy vegetables, wholegrain cereals such as spelt and rye, some cold water fish and not too much meat. Oh - and especially - keep moving! (Trust me on this, because it will keep you warm, too). Adamson et al. on What is a Healthy Nordic Diet? Danish online pamphlet with manifesto and guidelines. More of the same, but nicely laid out. So let's start living Scandi style.